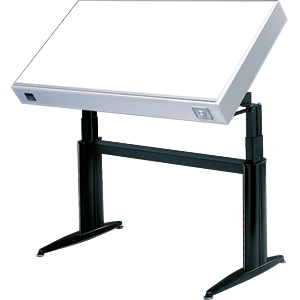 The CIE Standard Illuminant D50, with a correlated colour temperature (CCT) of 5000 Kelvin, is the predominant reference illuminant used in the graphic arts industry. This encompasses organizations involved in the creation and production workflow for graphic materials, from photographers and advertising agencies to prepress and reprographic businesses. The consistent use of standardised lighting throughout this value chain is indispensable in supporting accurate and consistent critical colour assessments of monitor soft proofs, hard copy proofs and prints of all types. 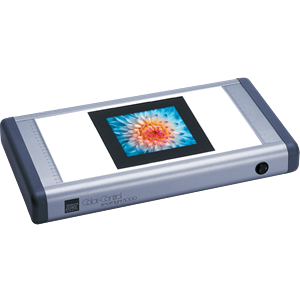 The D50 light source referenced in the standard ISO 3664:2009 "Graphic technology and photography – Viewing conditions" is defined by the CIE with a specific spectral energy distribution between 300 nm and 780 nm in increments of 5 nm. Other conditions to be fulfilled by a standardised viewing device in accordance with this standard are chromaticity coordinates (x and y for the 10° observer) with a tolerance of max. 0.005°, a general colour rendering index of Ra > 90, and metamerism indices of MIvis < 1.0 and MIuv < 1.5. The metamerism index further defines the quality of the light source simulating the D50 illuminant in the visible (VIS) and UV ranges. The UV aspect of this standard is particularly important given the prominent use of production materials containing optical brightening agents (OBAs). 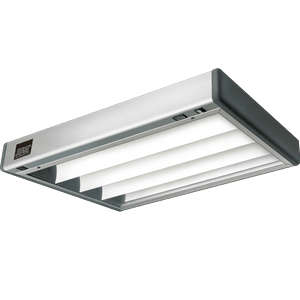 Natural daylight with certain characteristics contains a given amount of ultraviolet radiation, and the D50 illuminant is designed to approximate “horizon” midday natural daylight. 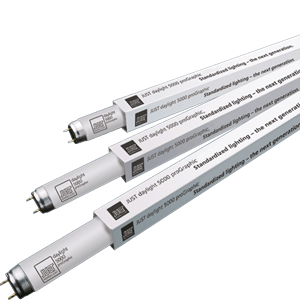 UV radiation excites optical brightening agents (OBAs) present in a wide variety of printing papers and substrates. As a result, both the UV content of light sources and OBAs present in papers influence colour rendering. To make this effect controllable in reprographic processes, and to achieve better matches between standardised light sources and the D50 illuminant, the 2009 version of ISO 3664 implements a far tighter metamerism index tolerance for UV in the 300–400 nm range (MIuv < 1.5). This amendment meant that the UV component in standardised lamps had to be substantially increased to achieve the standard and make OBAs in substrates visible and thus controllable using traditional colour management methods. To achieve the closed-loop process control objectives of standard ISO 12647-2:2013, all aspects of the reprographic process must be managed. In practice, the industry has taken time to implement these standards with respect to process controls, colour viewing conditions, measurement, and standards for proofing and printing processes. Measurement is defined within ISO 13655:2009 – Measuring condition M1, which includes UV. 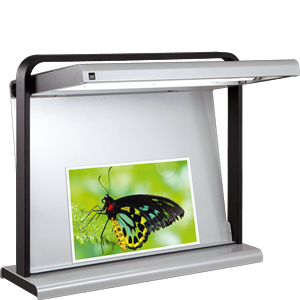 Lighting conditions defined within ISO 3664:2009 include UV. Printing process specifications and characterizations, including the effects of optical brightener, are defined by organizations such as Idealliance (GRACoL, SWOP) and FOGRA (recently published standards FOGRA 51/52) and others. 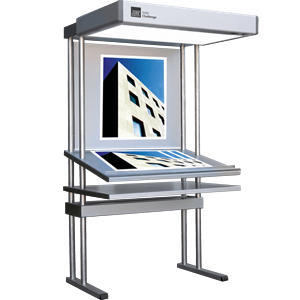 In conjunction with JUST daylight 5000 proGraphic lamps, our JUST standardised viewing devices meet the requirements of ISO 3664:2009 within very narrow tolerances, and are certified by FOGRA.